SANTIAGO, Jan 20 2017 (IPS) - In Latin America and the Caribbean 360 million people are overweight, and 140 million are obese, warned the United Nations Food and Agriculture Organisation (FAO) and the Panamerican Health Organisation (PAHO). “The rise in obesity is very worrying. At the same time the number of people who suffer from hunger has diminished in the region. We need to strengthen our efforts and have food systems with improved nutrition based on sustainable production methods to reduce those figures,” Eve Crowley, FAO acting regional representative, said Thursday at the organisation‘s headquarters in Santiago. 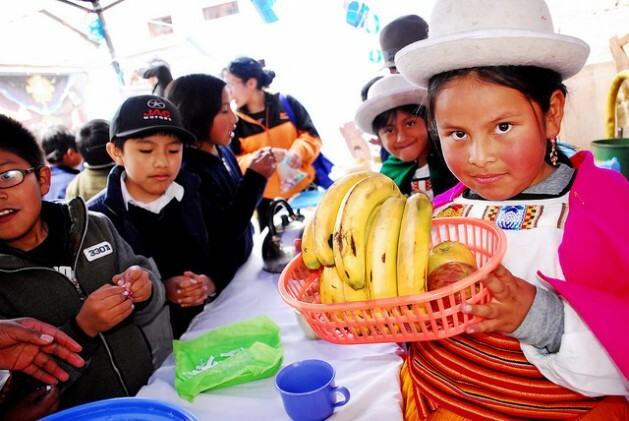 At the regional FAO office in Santiago on Thursday Jan. 19 the two organisations launched the Panorama of Food and Nutrition Security in Latin America and the Caribbean 2016, which sounded the alarm about the phenomenon in this region of just over 625 million people. The problem, highlighted the report, largely affects children and women, increasing chronic diseases, driving up medical expenses for countries and individuals, and posing a threat to the quality of the future labour force that national development plans will require. At the same time, the region has considerably reduced hunger: today only 5.5 per cent of the population of Latin America and the Caribbean is undernourished, the Caribbean being the area with the highest prevalence (19.8 per cent), largely because Haiti has the highest malnutrition rate in the world: 53.4 per cent. Chronic child malnutrition (low height for age) in Latin America and the Caribbean also dropped, from 24.5 per cent in 1990 to 11.3 per cent in 2015, which translates into a decrease of 7.8 million children. Despite the progress made, currently 6.1 million children still suffer from chronic malnutrition: 3.3 million in South America, 2.6 million in Central America, and 200,000 in the Caribbean. About 700,000 million children suffer from acute malnutrition, 1.3 per cent of them under the age of five. Asked whether the difficulty of access to natural, good quality foods is due to the high prices or to a flawed production and distribution system, Crowley told IPS that it is “a combination of factors“. “We talk about a food system because it involves a set of factors – from supplies to which foods are available at a national level. For example in Latin America there is a great availability of sugary foods and meat. But ensuring physical availability and access to nutritious, healthy, affordable fresh food in every neighborhood is still hard to achieve,” she said. “There is evidence that food high in bad calories, from ultra-processed sources, is less expensive than healthy food, and this poses a dilemma to guaranteeing good nutrition for the entire population, particularly people in low-income households,” she said. Crowley said there are changes in consumption patterns, with people shifting away from their traditional diets based on legumes, cereals, fruits and vegetables toward super-processed foods rich in saturated fats, sugar and sodium, which are backed by extensive advertising. She called for better information, nutrition warnings, taxes on unhealthy foods, and subsidies for healthy foods necessary for the population. With the exception of Haiti (38.5 per cent), Paraguay (48.5 per cent) and Nicaragua (49.4 per cent), overweight affects more than half of the population of the countries in the region, with Chile (63 per cent), Mexico (64 per cent) and the Bahamas (69 per cent) showing the highest rates, states the report. Erick Espinoza, a physical education teacher in a private school in a middle-class neighborhood in Santiago, sees the problem of the change in eating and behavioural habits of his students, aged six to 10, which is a reflection of what is happening throughout the region, and in particular in the countries with the highest overweight and obesity rates. “As snacks, they don’t bring fruit, only potato chips, crackers or cookies, fizzy drinks, juice or milk high in sugar. And they don’t just bring a small package, but sometimes two or three packages or even a big one,” he told IPS, referring to the snack during recess. Since 2016, kiosks that sell food in Chilean schools have been prohibited from selling foods high in sugar, sodium or fat. “They have to sell fruit, but the kiosk is not doing well because the children don’t buy fruit or yoghurt, but bring other things from home,“ said the teacher. Alexandra Carmona, a teacher at a municipal school for children aged four to 17 in a low-income neighborhood in Santiago, pointed to a different problem. “There was an obese boy who was really bullied. Everybody would say ‘hey fattie‘, ‘hey grease ball‘. So I called the parents to tell them what was happening, but they didn’t give it any importance,“ she told IPS. The boy ended up in a special school even though he had no learning disability. At her school, the school provides meals, but many children won‘t accept the legumes and balanced diet that is offered. The Panorama reports that 7.2 per cent of children under five years old in the region are overweight, which means a total of 3.9 million children, including 2.5 million in South America, 1.1 million in Central America and 200,000 in the Caribbean. The countries with the highest rates of overweight in children under five years old are Barbados (12 per cent), Paraguay (11.7 per cent), Argentina (9.9 per cent), and Chile (9.3 per cent). The report also points out that several countries have adopted taxes on sugary beverages, including Barbados, Chile, Dominican Republic and Mexico, while others such as Bolivia, Ecuador, Peru and Chile have laws on healthy nutrition which regulate advertising and labeling of food products. With respect to the countries that stand out in sales per person of ultra-processed products, the report says that Argentina, Chile, Mexico and Uruguay exceed the regional average of 129.6 kilograms per inhabitant. Mexico ranks first, with 214 kg per inhabitant, and Chile is second with 201.9 kg. In 30 of the 33 countries studied , more than half of the population over 18 is overweight, and in 20 of them obesity among women is at least 10 percent higher than among men. In addition to the lack of access to healthy foods, she mentioned the difficulty of access to clean water and sewage services, education and health services, and social protection programmes, among others.